Baruch Performing Arts Center presented a Thoreau song cycle by Gregory Spears and Virginia Woolf's Diaries by Dominic Argento. Spears, a phenom among contemporary composers, loves Henry David Thoreau, but found his poetry less than thrilling. Diving into his prose, he decided to take up the more difficult challenge of setting prose to music. He devised an emotional story arc, in which Thoreau departs civilization, relishes nature and contemplation, and ends up returning to the world. All composers have to ask, as they begin composing to words, will I control the words, or will the words control me? With a poem you start with meticulously crafted musical words. A composer discovers the music of the words. The poetry suggests its own melodic contours, meter and counterpoint. If a composer can find the music of the poem, then the poem has its own way of dictating the music. Spears has set these words both bending them to fit the music and also allowing them to effect him. 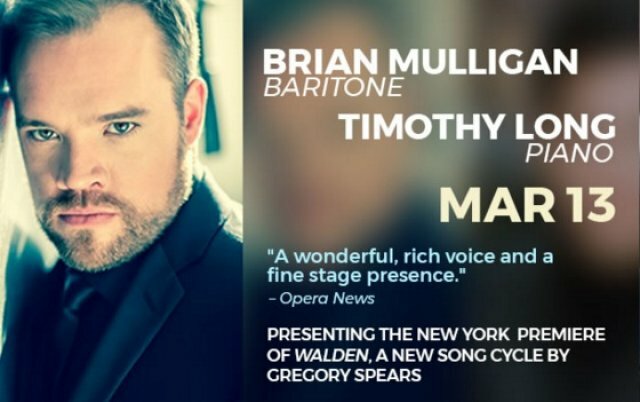 The steely and melodic baritone Brian Mulligan said that he found the music chock full of words, hinting that he had never had to caress so many, or send them out. The listener receives them as both story telling and picture painting. They sit well in the human voice, Mulligan's of incredible range, from a bass growl to a tender head voice. Spears has lifted rich passages from the writer's journey to a personal wilderness in the right circumference of Walden Pond. As he releases his societal concerns and enters the passionate world of nature, the music moves from a simple two note tune, to a palette full of color and light. Never does Spears forget that even splendor can be presented simply. Timothy Long, recently appointed Music Director of the Eastman School of Music's opera department, accompanied on the piano. He has an acutely sensitive ear. The resonance of woods which echo bird calls and falling leaves was often dramatized in notes held both by the pianist and the singer until all their overtones were merged into the concert hall. Dominic Argento's The Diary of Virginia Woolf followed the intermission. Argento, who died this year at ninety, composed the piece for Janet Baker, who had replaced Jessye Norman and then Beverly Sills, in the original commission. The sun rising in Woolf's Waves had been suggested as a theme, but as Argento read Woolf's Diaries he found them more interesting. Solving some of the issues involved in setting text, he would arpeggiate the voice, and offer decorations more often heard in other instruments. Mulligan took to the text with a feminine flare, even as he clearly accented syllables. Baruch offers this performance area flanked by tall wooden screen to absorb and deflect sound on the stage and special acoustics. It was an enlightening and delightful evening of a singer speaking in notes.